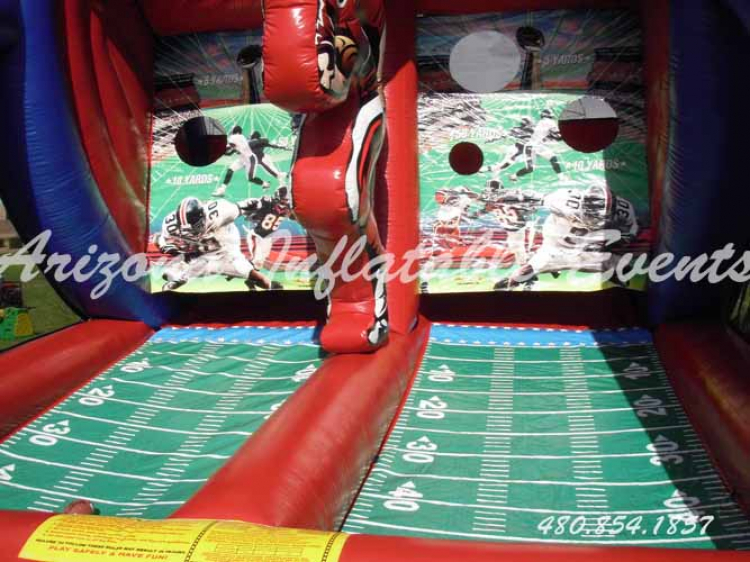 The inflatable First Down football toss is an exciting inflatable game rental that lets players young and old show off their skill. 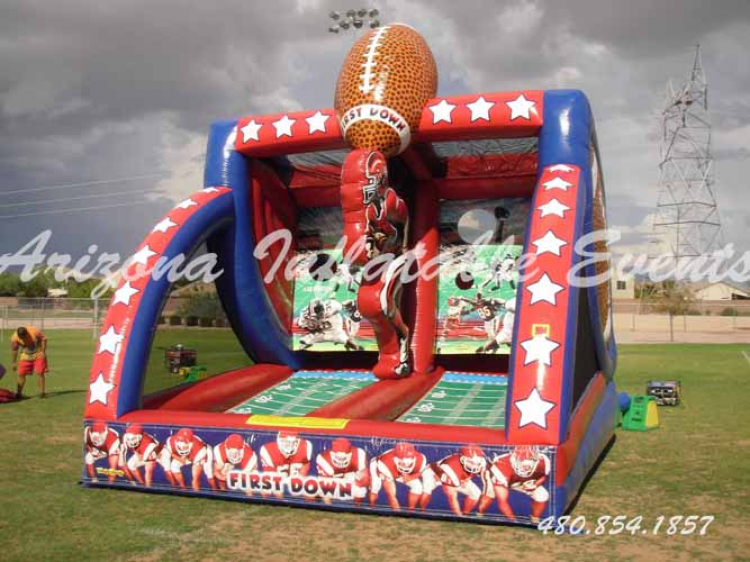 Future quarterbacks can face off with each other, as they throw the football across the inflatable field to the back wall that holds a line of receivers. This giant game measures 16 feet long by 14 feet wide by 17 feet high but requires a space 20 feet long by 17 feet wide. The competitive spirit of this inflatable football game really gets going as each player tries to score more point. This is a great inflatable game to promote healthy competition and sportsmanship between a co-works or father and son. 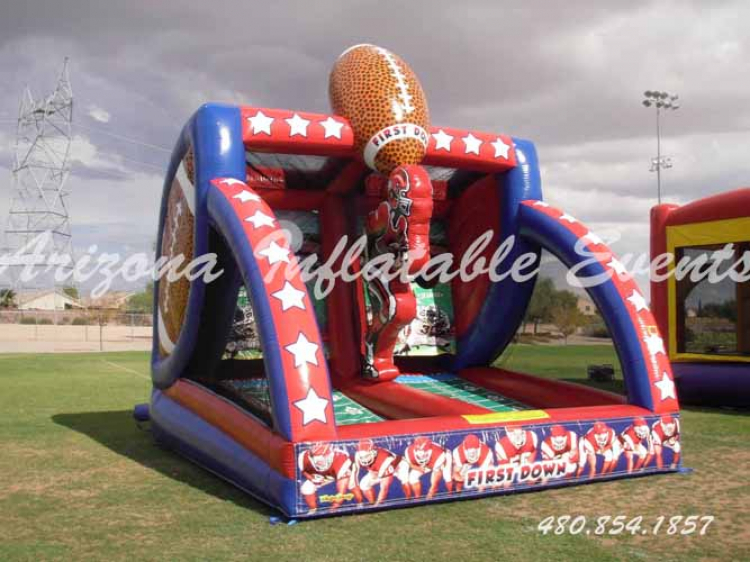 Call Arizona Inflatable Events to reserve your giant inflatable football game today. Though we deliver to many different cities like Mesa there may be a delivery fee or a delivery minimum. Other important facts to know, all Inflatable/Ride/Rental item prices include standard set up and removal from location unless otherwise noted. Standard setup is considered real grass where stakes can be used, and power is within 75 feet (not all items require power). Standard delivery is within 200 feet of flat ground from the delivery truck, call the office if your delivery is outside these specifications. If your rental item requires water please make sure that there is water source available on site within 50 feet, you may also want to check for hoses and a water key. Park or non-residential events may require additional set up material at additional cost. Additional Fees may apply to non-grass setups. Items will not be carried through homes, offices, or lifted over walls without prior approval and additional fees. We cannot guarantee that all products listed on our website are available. Call the office to confirm additional delivery restrictions, details and availability.